ASHBURN, Va. (AP) — Fish Smithson still can’t get the number 427 out of his head. Being a teammate of Washington Redskins running back Samaje Perine is one constant reminder. Smithson was a safety for Kansas in November 2014 when Oklahoma’s Perine rushed for an NCAA record 427 yards that still stands today. Three years later, a season-ending injury to Rob Kelley has thrust Perine into the role of the No. 1 back for Washington. Perine has 66 carries for 210 yards through nine games but will be expected to pick up that pace starting Sunday at the New Orleans Saints. 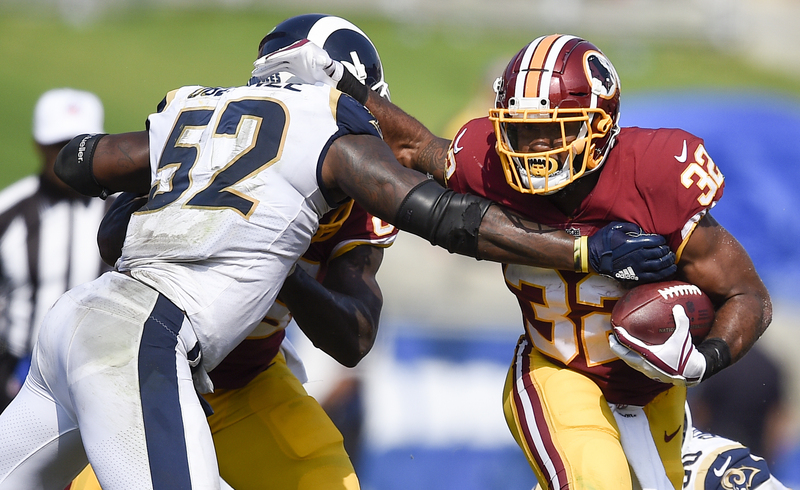 The Redskins will split carries between Perine and third-down back Chris Thompson and signed Byron Marshall off the Philadelphia Eagles’ practice squad, but this is the rookie fourth-round pick’s show now. He already has one start under his best and felt good about getting loose with nine rushes for 35 yards against Minnesota in Week 10 when Kelley injured his left knee and ankle. Perine, whose last name is pronounced “P-rine,” has one fumble this season that came on an exchange with Cousins. They expect that chemistry to come with more handoffs, as will the 22-year-old’s familiarity with the offense, blocking schemes and opposing defenses. At 236 pounds, Gruden said the Redskins would like to see Perine run over more defenders, break more tackles and pile up some more yards after contact. That would help their 23rd-ranked running game, which hasn’t been able to keep enough opposing defenses honest. Tags: NFL, redskins. Bookmark the permalink.